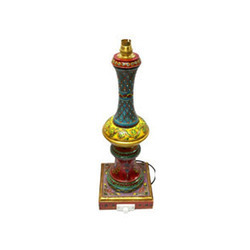 Especially hand-crafted, this is a unique dual (It can be illuminated either way, top or bottom at one time with the help of two way switch) art lamp in wood and mirror and lovely artistic handicraft base in vibrant natural colors. Ideal for any corner in your office, study or bedroom, this is another contemporary decor piece which can soothe your mood and the ambiance the moment it is switched on. The supports for each side of the lamp shade are as much functional as good-looking. This lamp can easily blend with your modern or individualistic interiors. Note: ABLAZE (INDIA) provide only lamp Base, We do not provide any bulb or CFL with this. Slight variations in dimensions may occur as the product is handmade. We are engaged in offering Decorative Wooden Printed Table Lamp that is an ideal lamp for any corner of office, study or bedroom and gives a contemporary decor which can soothe the mood and the ambiance the moment it is switched on. We are engaged in offering Stylish Electric Wooden Table Lamp that enhances one's efforts and art of beautifying home or office. Our offered Designer Wooden Table Lamp is a handcrafted artifact that can be illuminated, either way, top or bottom at one time with the help of two-way switch an ideal lamp for any corner of the office, study or bedroom.